Inspired by two workshops that I taught together with Susanne Feld in 2017, I want to create more opportunities to continue working with smaller groups in more intimate settings. Each day of this series is co-led by one dear friend and colleague from this Dream-Team below and myself. We all work in different fields related to touch and movement. 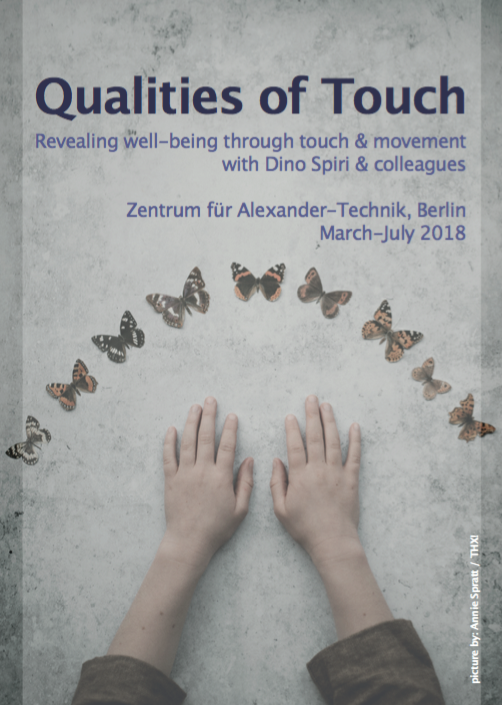 Whether it be Shiatsu, Osteopathy, Klein Technique, Feldenkrais, Body Mind Centering or The Alexander-Technique – all involve the body/mind and touch as one of our common mediums to communicate. I am incredibly intrigued by and interested in sharing, combining and questioning the differences and similarities between these approaches. How do the various techniques direct your own attention, awareness and presence? How do they expand into touch and movement? Especially the fragile overlaps and disharmonies between the approaches hold a potential for learning. Each Sunday of this series provides an opportunity to meet, play, communicate, and learn through movement and touch. We will take time to ground ourselves in our own bodies and there will be clear suggestions that guide us into touch and movement alone, with a partner and in a group. Anybody who would like to explore touch and small movement in an intimate setting and under qualified guidance. Professional bodyworkers who are interested in new ideas and inspiration for their own practice. 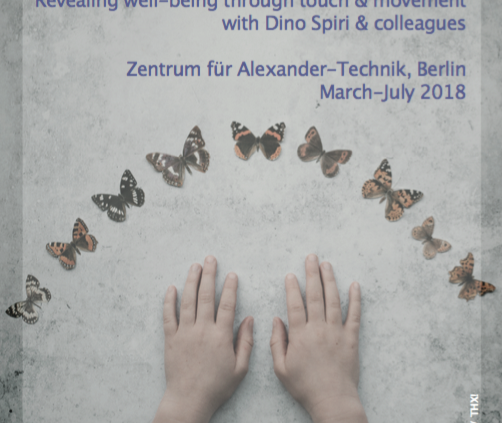 Shiatsu, Osteopathie, Klein Technik, Feldenkrais, Body Mind Centering und Alexander-Technik – jede dieser Disziplinen erforscht das psycho-physische Selbst in Bewegung und Kommunikation durch und in Berührung. Ich finde es seit vielen Jahren bereichernd mich mit Kolleg*innen über Unterschiede und Gemeinsamkeiten auszutauschen. Wie laden die unterschiedlichen Techniken dazu ein deine Aufmerksamkeit auszurichten und welchen Einfluß hat das auf deine Bewußtheit? Wie wird mit Bewegung und Berührung umgegangen? Besonders das Feld der fragilen (scheinbaren) Disharmonien und unterschiedlichen Ansichtsweisen birgt Lernpotential. Jeder Sonntag dieser Serie bietet eine Gelegenheit zum Spielen, sich Treffen und Kommunizieren – zum gemeinsamen Lernen durch Bewegung und in Berührung. Wir werden uns Zeit nehmen uns mit unserem eigenen Körper zu verbinden und es wird klare Vorschläge geben, die uns in Berührung und Bewegung führen (alleine, in Partnerarbeit und mit der Gruppe). Die Workshops sind offen für jede*n die/der sich mit Berührung und Bewegung in einer kleineren Gruppe und unter qualifizierter Leitung öffnen möchte. Professionelle Bodyworker*innen, die ihre eigene Praxis mit neuen Impulsen bereichern möchten. is a certified teacher of the Alexander Technique and since eight years deeply involved in practising and teaching various disciplines of movement and touch. His work is strongly rooted in practices like Klein Technique, BMC, AT and Vipassana meditation and aims to create a bedding for meeting oneself and each other. Nina studied Innovation Management and her work at the moment involves facilitating ideation processes by means of empathy, creativity and communication. Different body and awareness practices have been part of Nina’s life since many years – BMC being her most recent passion/focus. In 2018 she will be certified as Somatic Movement Educator (BMC) and anticipates to integrate these new impulses in her daily work. Alicia Grant is a choreographer and dancer based in Berlin. She received a BFA in Dance from York University in Toronto, Canada and has studied Osteopathy in both Canada and Europe. Her work in performance, video and installation has been presented from stages to swimming pools to abandoned factories to galleries. She shares why-am-i-alive dance practices at Studio 303 in Montreal, Love-In in Toronto, Ponderosa in Stolzenhagen and TanzFabrik in Berlin. She is interested in power dynamics, transformation, fear and intimacy and investigates these topics through osteopathic raves, negotiation of touch and hypnosis. Hanna is a certified teacher of Klein Technique and a Certified Laban-Bartenieff Movement Analyst (CMA). She has taught Klein Technique to dancers and non-dancers for many years. She is intrigued by the concept of connectivity in its broadest sense and has witnessed it being embodied and changing lives many times. In addition to teaching Hanna works as a choreographer as well as a facilitator for contemporary dance in schools. She recently received her MA in Choreography from the Amsterdamse Hoogescholen for de Kunsten. One day 100-65 € We think 100 Euro is an appropriate price knowing that some people can’t afford it. Pay as you can – no questions asked.